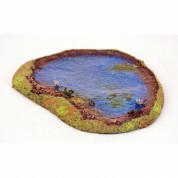 The Swamp is an impassable, difficult terrain; also has often special rules. The terrain model is designed to balance beauty and reality. That kind of wargaming model is real enhancement and embellishment for your gaming. The Lake is an impassable, difficult terrain; also has often special rules. The terrain model is designed to balance beauty and reality. 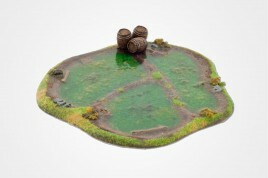 Forest - one of the basic and primary terrain for battle games and wargaming. Six handmade trees on stands and one spring bushes deciduous and additional stand-base marking the area of dense FOREST. Model of wooden bridge standing on the piece of river. 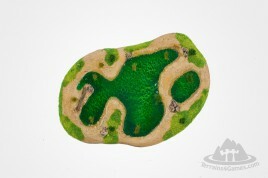 Model based on the casting resin - painted in an effective way,specialized mass modeling creates an effect of clear water The terrain model is designed to balance beauty and reality. That kind of wargaming model is real enhancement and embellishment for your gaming. 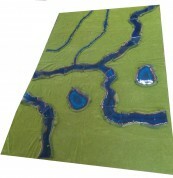 Large river with lesser stream, two lakes - 30 elements.